Does the Ember Temperature Control Mug Really Work? Most people are pretty picky about the temperature of their coffee or tea. The problem is these same people are the ones that are on the go all the time and before long these hot beverages cool off and are no longer what the drinker of them wants. There are some great solutions for this but perhaps one that is taking the lead is the Ember Temperature Control Mug. The Ember Temperature Control Mug is no everyday thermo mug that so many people use today to keep their drinks hot or cold. This is a mug that can actually maintain your chosen temperature of your drink when it is used with the Ember Charging Coaster. The promoters of the Ember Temperature Control Mug claim that this mug will keep your drink at the temperature you enjoy the most for up to two hours. However, if you utilize the charging coaster then you are good to control the temperature for the entire day. 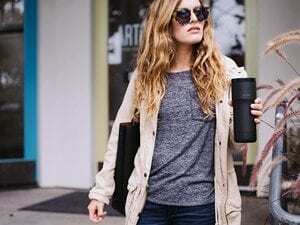 The hype goes beyond the standard type thermos mugs that many of us are used to because of the option of being able to keep your drink at a chosen temperature all day long. If you are expecting the Ember Temperature Control Mug to be cheap you are in for a surprise. This mug costs $149.95. This is because it can be used with an app that lets you do lots of cool things with it. If you are going to pay this kind of price for just one mug then you are going to want to use it to its fullest extent. That means using it with the app that lets you name your mug, control your temperature, and preset it. One may think at this price that there wouldn’t be many buyers but even on Amazon it has sold quite a few. TO date there are 65 reviews on the Ember Temperature Control Mug giving it a 3.5 star rating. We are going to give this Ember Temperature Control Mug a Try/Buy only because there are some that will find the Ember Temperature Control Mug to be a real convenience. We are somewhat held back because of the price plus only having a 3.5 star rating which indicates there were some that were not totally satisfied. Really without the charging coaster you are only getting a mug that keeps your drink at temperature for about two hours. There are plenty of thermal mugs that will do the same thing and are a whole lot cheaper. We know that there are a lot of coffee drinkers out there and they will go to great lengths not only to keep their coffee warm but also make sure that it is brewed in the right way. Again there are tons of coffee makers but one that we consider to be somewhat unique is the Cafflano, which you may want to check out. What do you think? Does the Ember Temperature Control Mug work or not? Does Snap N Strain Really Work? No, this mug does not work and neither does the “help” site – to send a “help” request, a serial number on the product is required, but there is no serial number on the mug. Therefore, I was unable to get online help or any help at all when the mug wouldn’t “pair,” as required for inputting desired temperature. I called the company and got a voicemail which promised to call back but after two days, I still haven’t received that call. This is an expensive product and the directions are faulty, the mug is faulty, the company is non-responsive. I would like to send it back for a refund but there is no way to know where/how to do that since the company doesn’t answer phone calls.